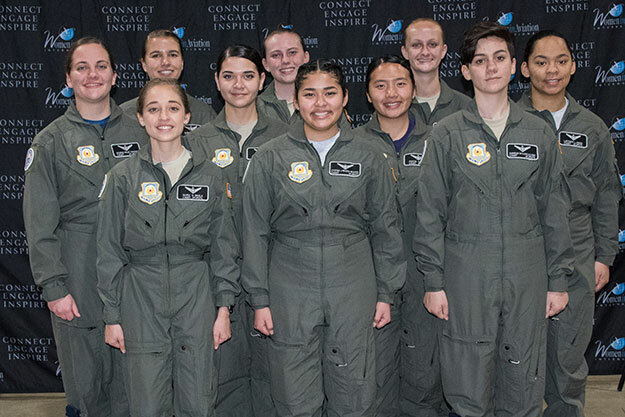 Aviators from all over the country traveled to sunny Long Beach, California, for the 30th annual Women in Aviation International Conference March 14-16. Ten of the female aviators attending were Air Force Junior ROTC cadets who recently earned their pilot wings. The cadets completed the Air Force JROTC Flight Academy program last summer, where they had the opportunity to earn their private pilot's certificate. "The Chief of Staff of the Air Force Flight Academy Scholarship is designed to bring back the ‘luster' of aviation amongst the nation's youth as well as increase minority and female participation," said Lt. Col. Willie J. Allen II, Air Force Junior ROTC Flight Academy director. "The current minority and female presence in aviation is around 10 percent and six percent respectively. The flight academy scholarship has surpassed these statistics based on the fact that 37 percent of our applicants and 25 percent of our selects were female or of a minority demographic. Collaboration with organizations such as (Women in Aviation International) and our partnering universities enables real growth for the industry as well as providing mentors in both civil and military aviation career fields." "The flight academy quite literally gave me my wings and afforded me the opportunity to grow and learn as much as possible in the field of aviation," Hall said. Women in Aviation International is a nonprofit organization that encourages the advancement of female aviators all over the world in both the military and civilian sector. "The conference is absolutely amazing," said Jailyn Rivera, an Air Force Junior ROTC cadet and a junior at Citrus High School, Florida. "I'm so thankful for this experience. I have met so many amazing women who have accomplished so many things, and it really gives me hope for my future, because I've had some things that I've had to overcome. It reminds me that as long as you work hard and keep pursuing your dream then anything is achievable." During a podcast interview with Politico in February, Wilson said that America is building a more lethal, ready Air Force in which women will play a key role -- the nation must change how it talks about its protectors. She also added that hard work and talent are valued in the defense of the nation and the doors are open to women. "Flying is incredible, and it should not be limited to just one gender or one ethnicity," said Hall. "We see the challenge that, yes, it's predominantly been a male-dominated industry, but there's no reason why women or men can't do it. I look forward to the challenge and working with both men and women from all backgrounds and walks of life." The flight academy is a response to Air Force senior leadership's priority to increase diversity in aviation and return the thrill of aviation to high school students. "JROTC is not only for the military," said Rivera. "I think that's where some cadets and students get misinformation. It really is just to create a better citizen and help you create better organization for your life and become a focused person so you can establish a good foundation for possible careers. It really just sets you up to be a successful individual."